Foodwalk on Mint Street on a rainy November evening. 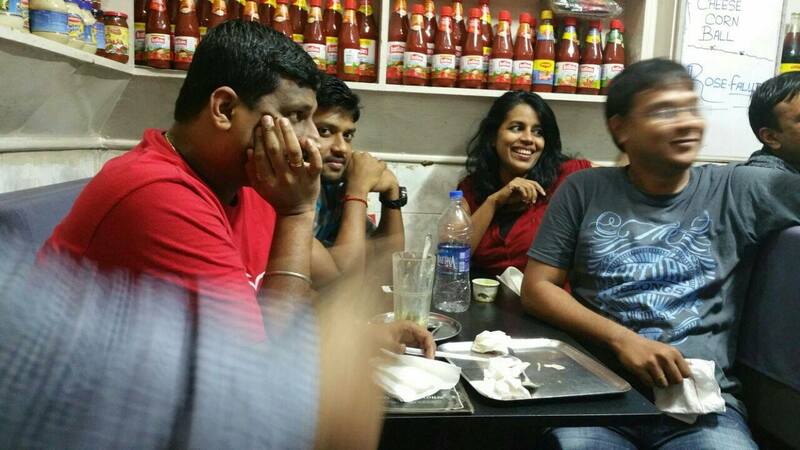 This time the walk was planned in North Chennai ie: Sowcarpet/Mint area and decided to meet at Kakada Ramprasad. 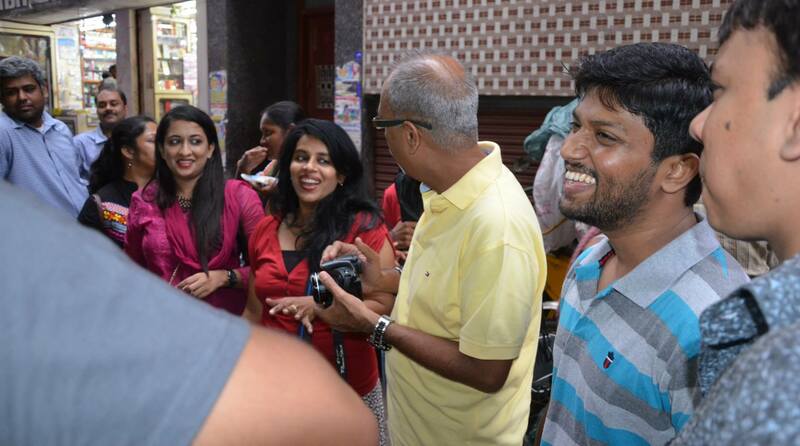 Shwetha who was leading the group, as a true leader arrived before all of us. Prem who never misses anything to do with food followed soon. Sandeep overcame all the delays due to parking challenges and managed to reach. 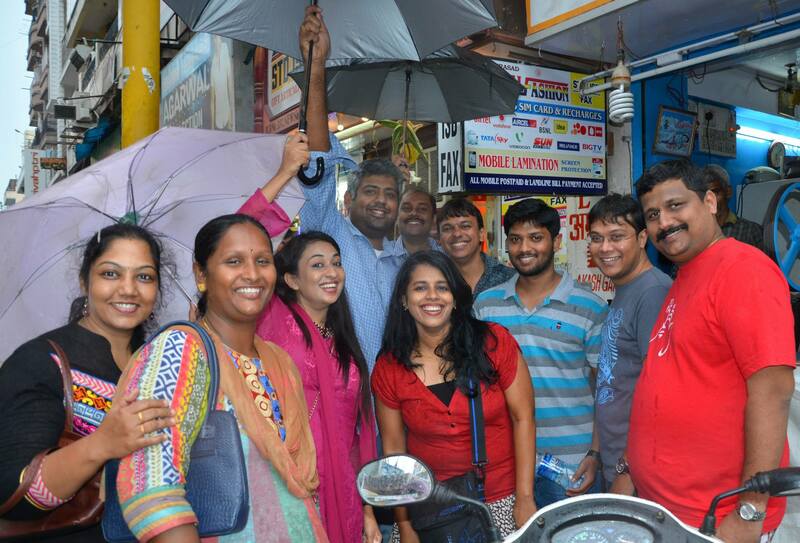 Soon we became a group of 15, to hit the roads of Mint, to try out the best of food, from that side of the country. 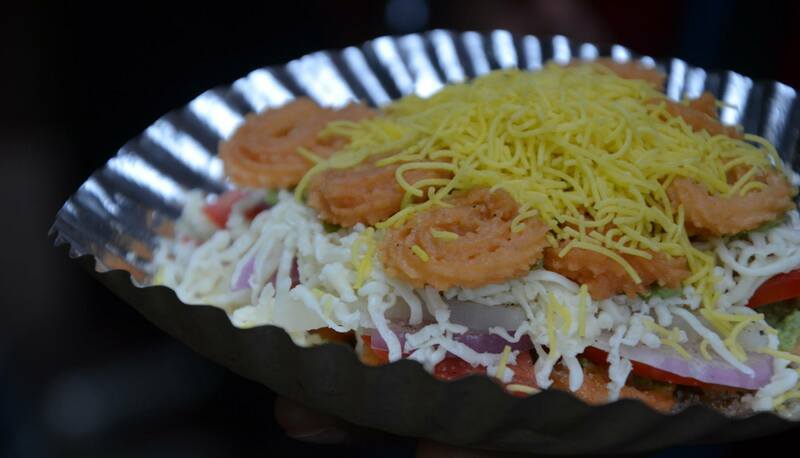 At Kakada we tried the Aloo Tikki chat, Behl-Puri, Sev-Puri, Dahi paapdi chat, Jelabi and Badam milk. We all thoroughly enjoyed the food. 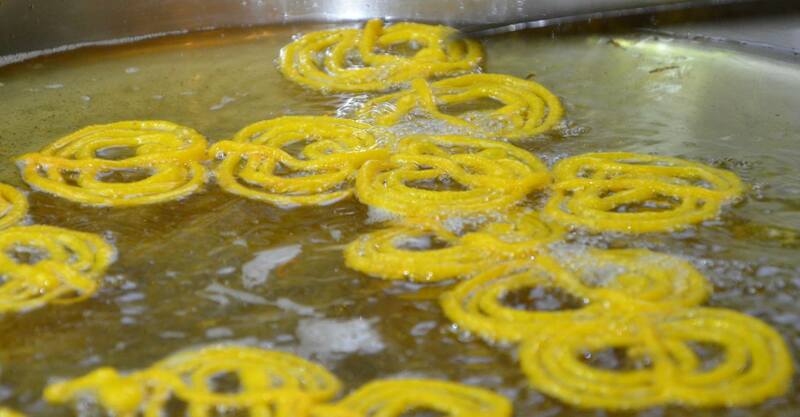 Personally I liked all their chats, their jelabi is one of the best and the Badam milk is famous too. 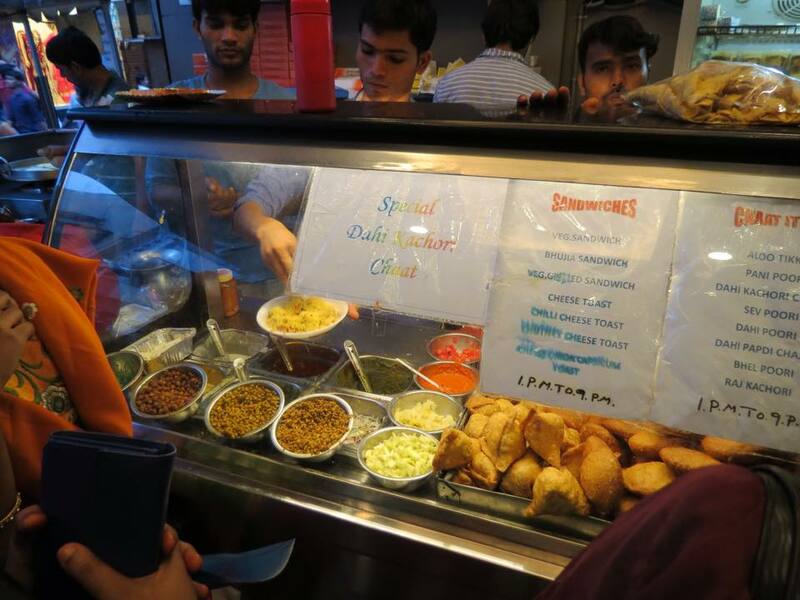 They have about three flavors of Paani for their paani puri. We dint try them this time, but I have tasted all three flavors (Hing, Pudina and Jeera) in the past and they are simply awesome. My personal favorite is Hing Pani. 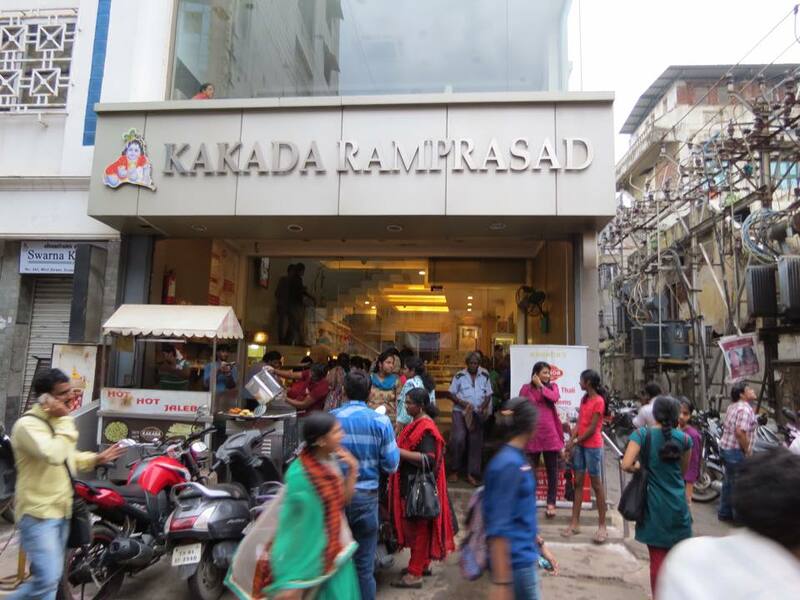 Kakada is more like the Shree Mithai and Gangotree type of place. Next, we decided to move on to Sardha Chats. 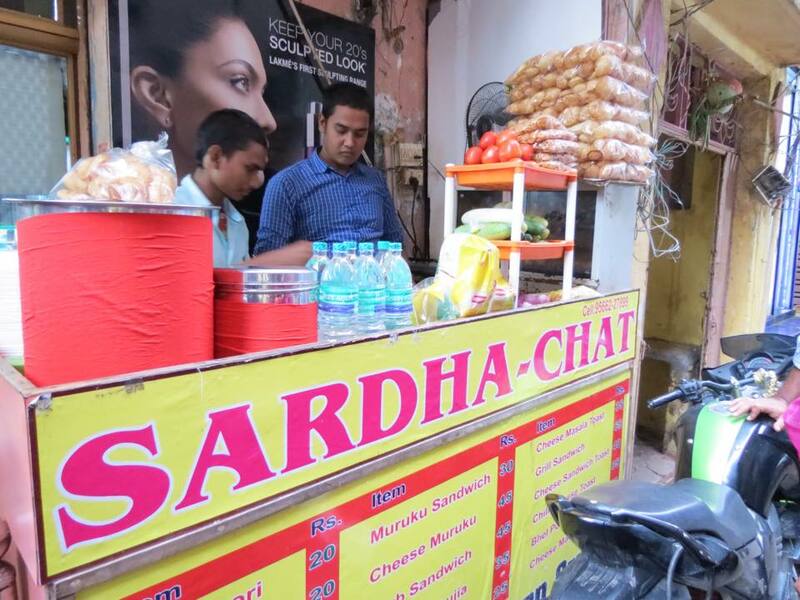 Sardha chats, were the first ever to serve their innovative Muruku Sandwich. Sounds interesting isnt’it.?? They truly are. 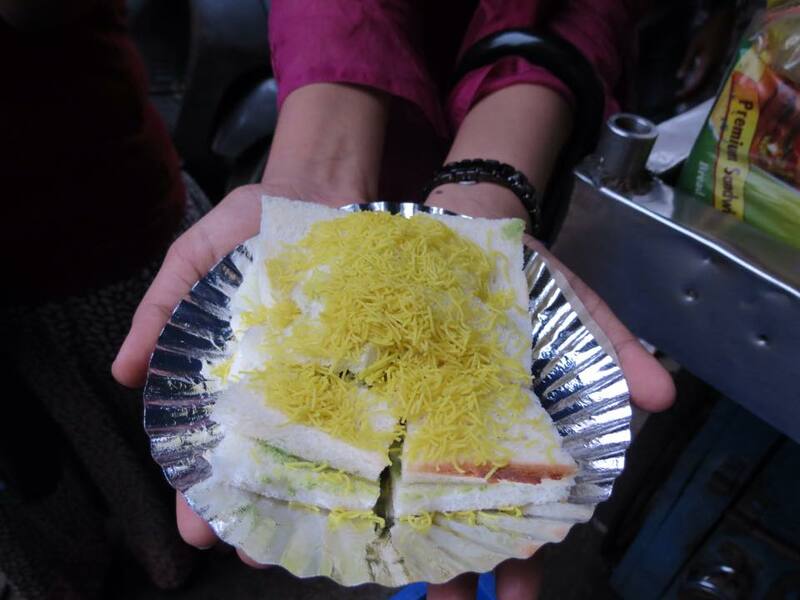 We tried two kinds on their signature sandwiches ie: Murukku Sandwich and Puff Sandwich. 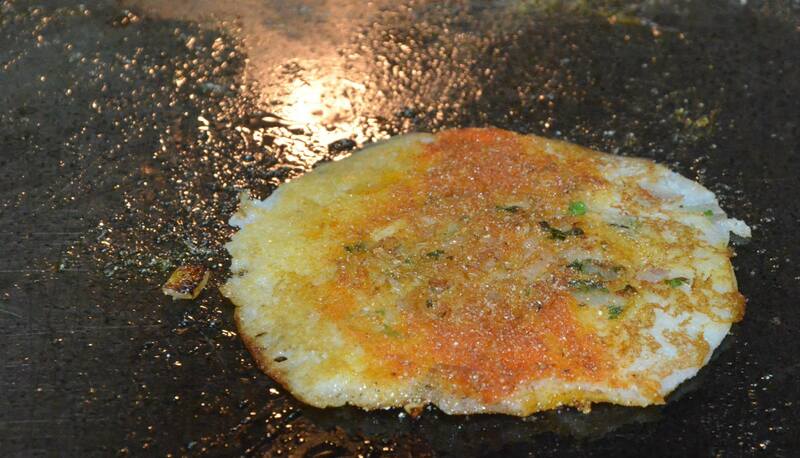 Murukku Sandwich is like normal veg sandwich without bread, Muruku is used on both sides instead of bread. Puff Sandwich is a puff with no filling, just the covering. 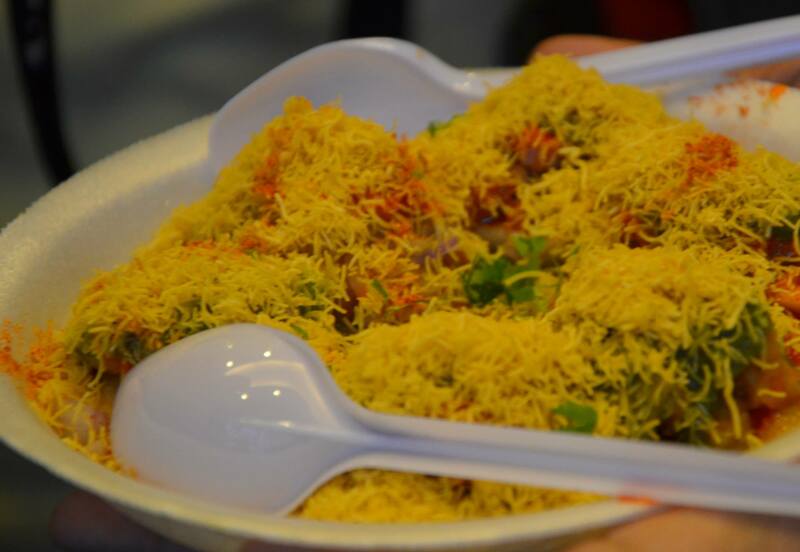 The puff is then opened and stuffed with chutney chopped raw onions and masala, this too comes with and without cheese. I personally loved the cheese version. ..yummy. Now with partially (!!!!) filled tummy, decided to try out one of the well known sandwich joint opposite to the Jain temple. It was like any other usual sandwich and good as well. Nothing signature-ful about it. Road side sugarcane juice is a total No No for me, but couple of places in sowcarpet looked cleaner and gave us some confidence to try out . Based on the recommendation, we barged into Ganesh cool bar. The place was really nice and cleaner than the others. 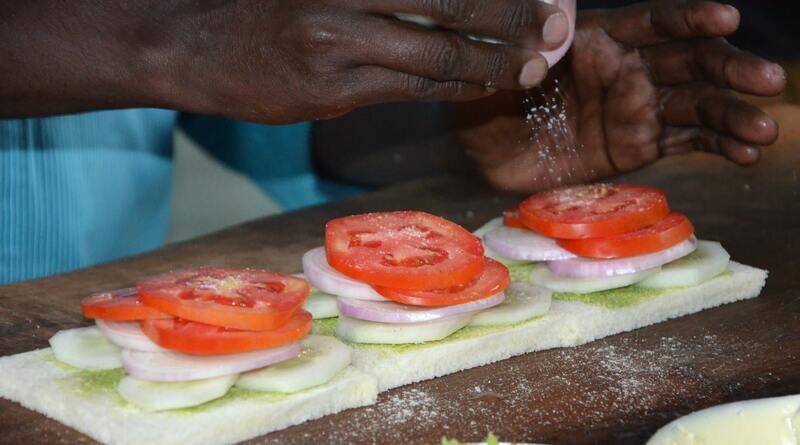 There comes Rahul with a recommendation to try out, yet another sandwich stall outside Mahaasakthi and opp Rasoee. Oh boy !!! !what a sandwich, it was just a perfect definition for any desi sandwich, the right kind of sandwich one would want, yummy and big. 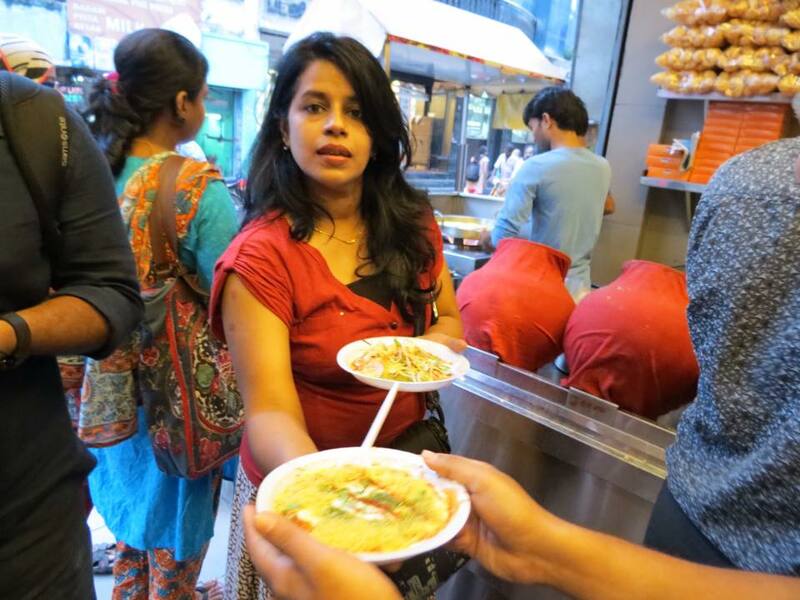 From sandwich to Pani Puri, Rajsri was the small shop we walked to get the best pani puri. 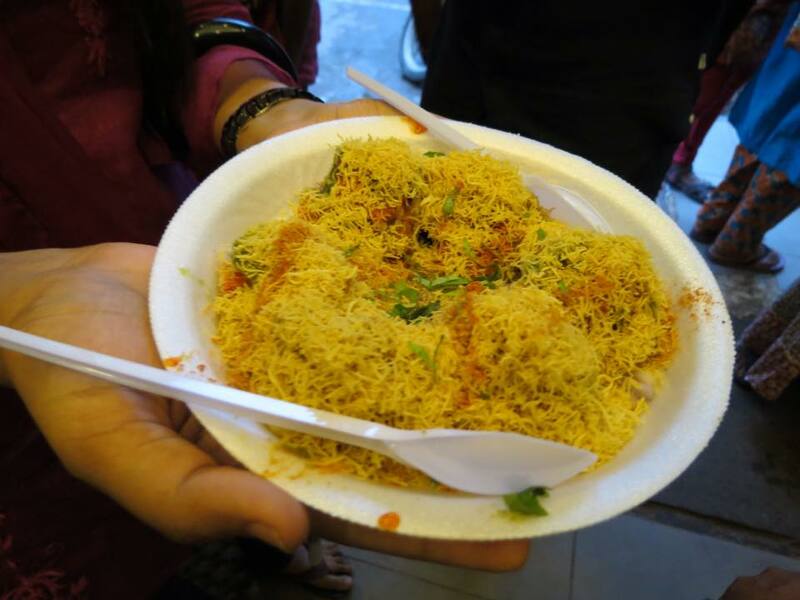 Our pani puri katori’s had a base of steamed moong and raw chopped onions and each pani puri were placed on this, we had the option of garnishing our puri with moong and onions if required. 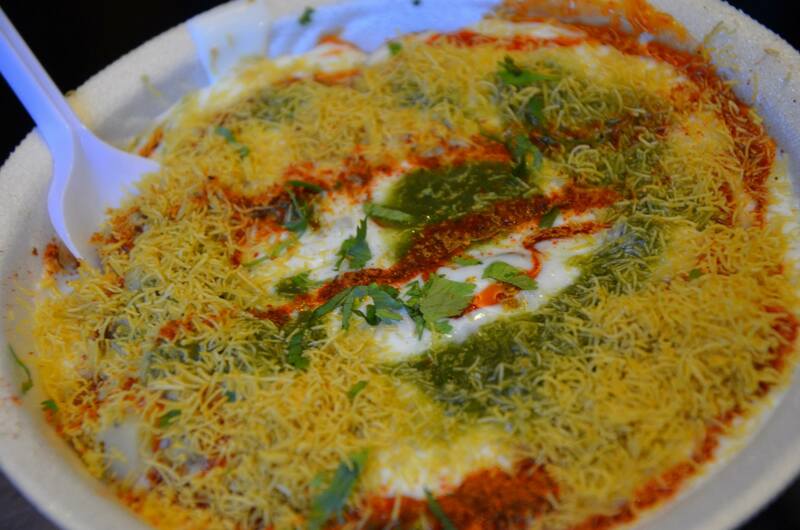 My suggestion, do not have the pani puri without the sweet chutney, its too spicy. 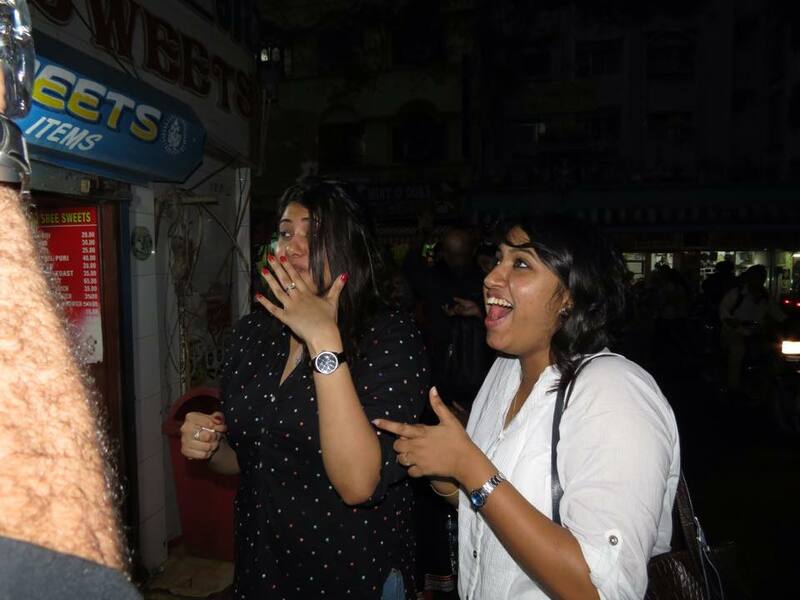 By this time it had started pouring, to my surprise, non of us were even bothered about the rains and we were busy planning out next stop, we were drenched, but decided we need to go on……. We walked back towards kakada. 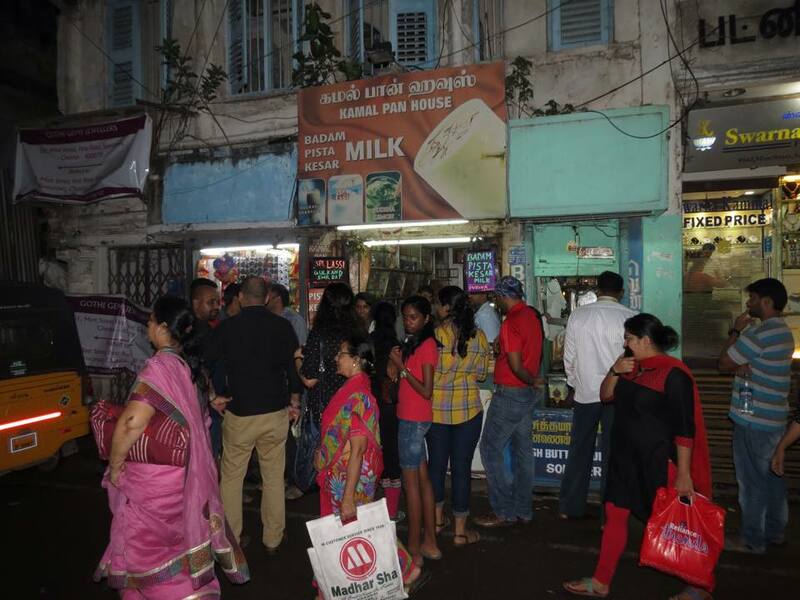 Opposite kakada, this small shop kamal pan house, they are the one’s who served the best Badam milk for many years and still do so, we stopped by for badam milk, Gulkand Sharbad, sweet pan and the most favorite drink for the evening was the Masala Thumbs up. 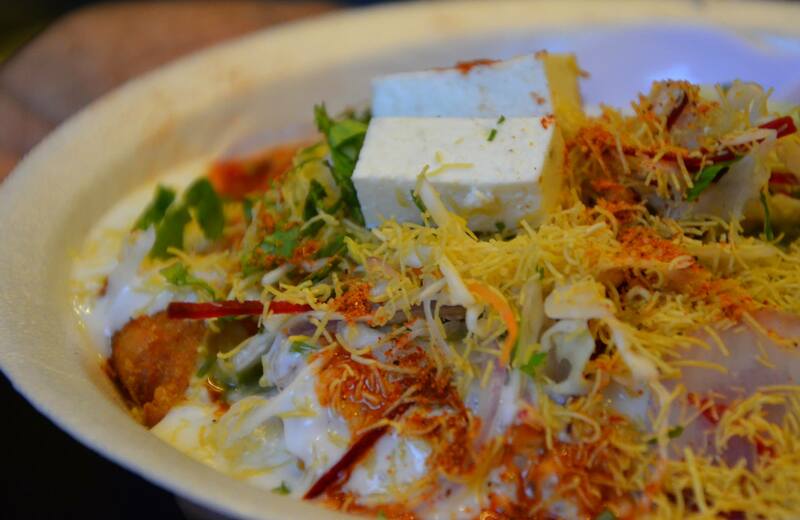 We started with ordering 2 of the masala thumbs up and the order went on increasing 4, 6….. 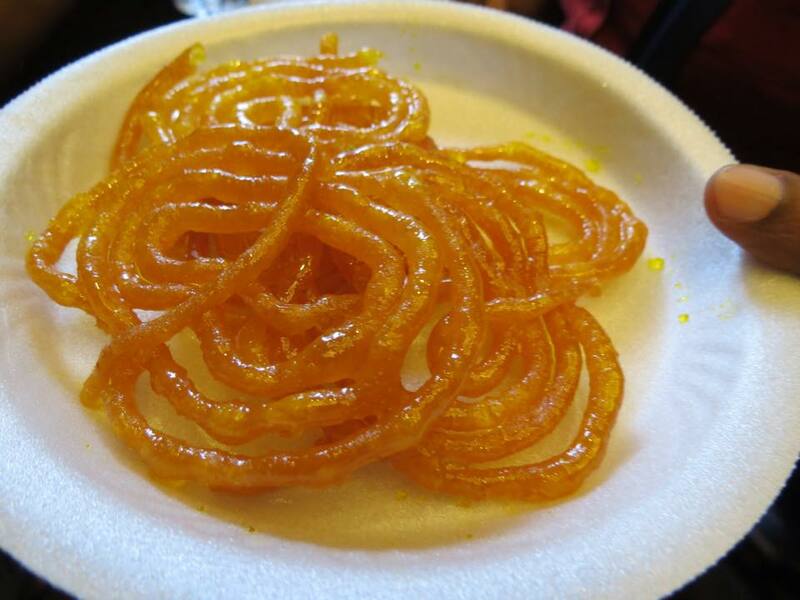 It was nicely spiced and such a digestive after all the food we had. 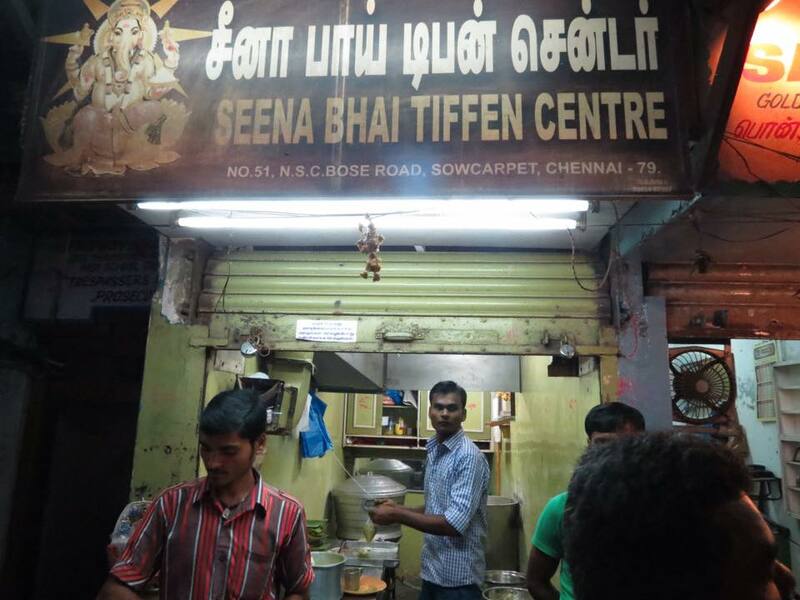 Now that we have too much chat, we to eat some south Indian food and so our next hop was at Seena bhai tiffin center, we had both their signature dish. The mini idli’s and the uthappam. 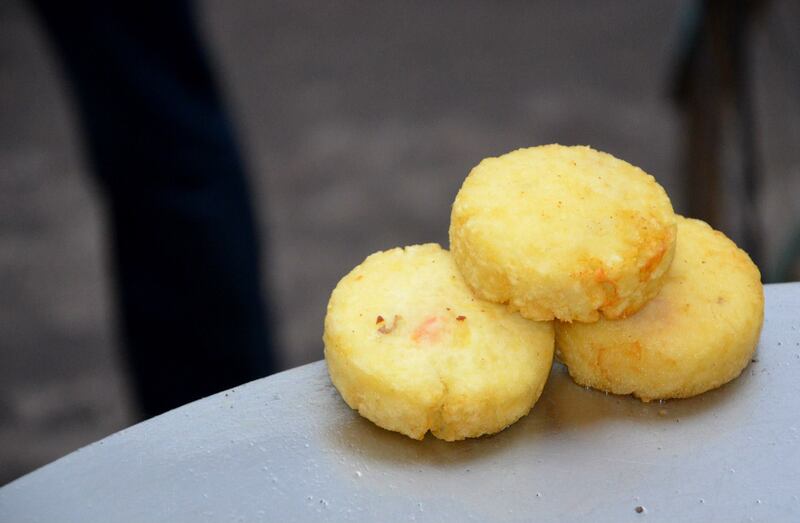 If you are high on cholesterol please do not try the uthappam, it’s loaded with ghee. But taste is out of the world (offcourse it would be with so much of ghee) they open are open only between 5pm-10pm all days. 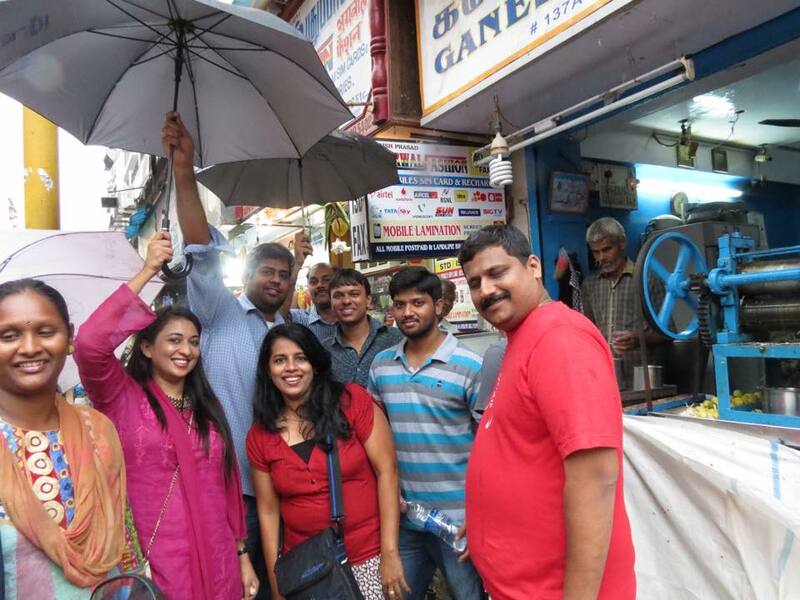 How can we leave the Foodies paradise without a bite of Vada Pav and so we had a recommendation to visit the place that got vada pav to Chennai. Mehta Brothers and truly this is the best vada pav in Chennai. 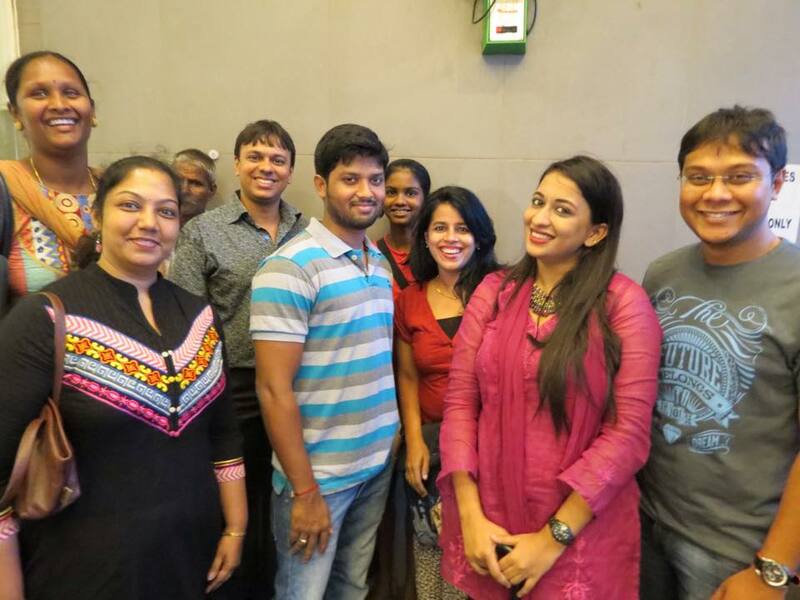 I went back to my Mumbai days for the first time in 16yrs of being in Chennai. 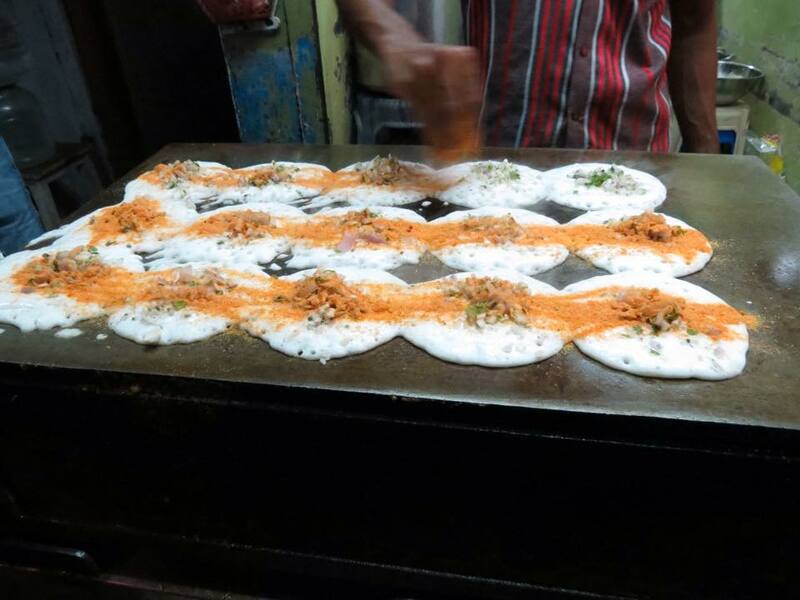 They do truly make the best vada pav in Chennai. We heard somebody whisper fruits ice cream and the nearest place from where we were for the fruit ice cream was Novelty tea house. So we all entered this tiny little place. There was laughter and noise all over the place, this was the first place were we could sit after 2 1/2hrs of walking. Only disappointment was we did not get fruit ice cream there, so we ended up ordering for Pan ice cream, which I thought was nice, but a few of them thought it was too sweet. 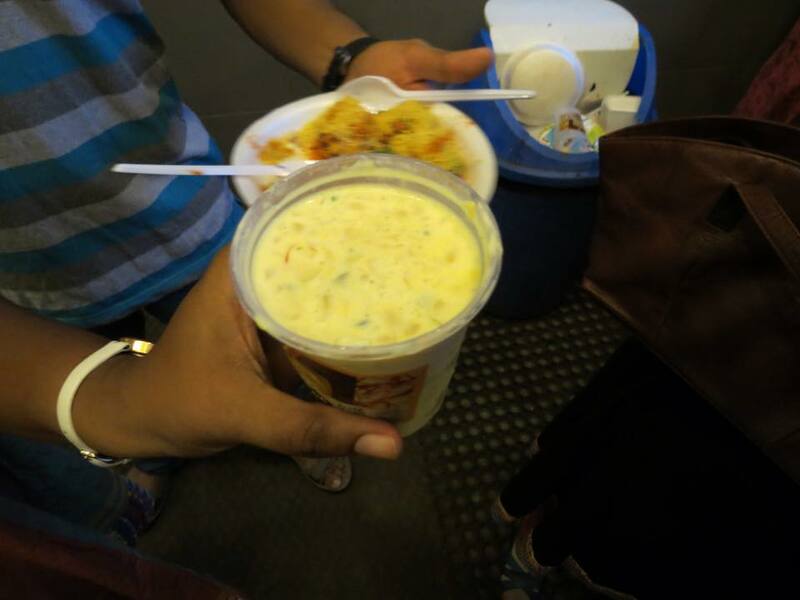 Looking around, Pav Bhaji was tempting us; the order for Plain pav Bhaji and cheese pav bhaji was placed. 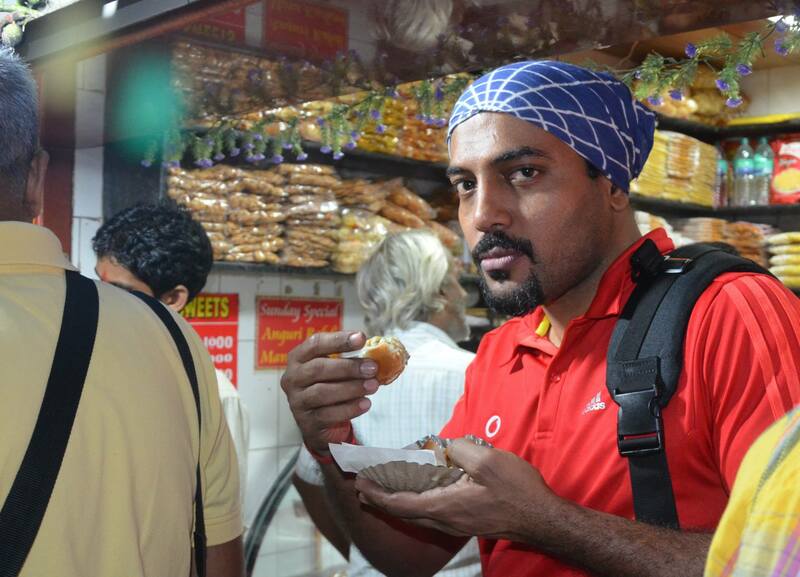 I am not a big fan of pav bhaji at Novelty, my feeling is its too greasy for my taste, and so I decided to skip it. But the others did enjoy it! 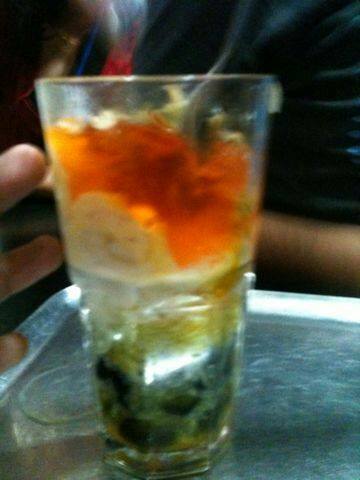 I had shouted “ Falooda” 1hr before we came to Novelty and someone was holding on to it and said we have to have falooda and so we ordered for 2 glasses of Falooda and boy oh boy the falooda looked out of the world colorful huge glasses vanished as soon as it came, we ordered for 2 more, which also got gulped in minutes. With our tummy full we thought we should call it a day! It was an evening of making new friends, who share the same passion as yours “FOOD” I personally believe that every person I meet in my life has a meaning in my life I cherish each and every moment I spent with each one of you. 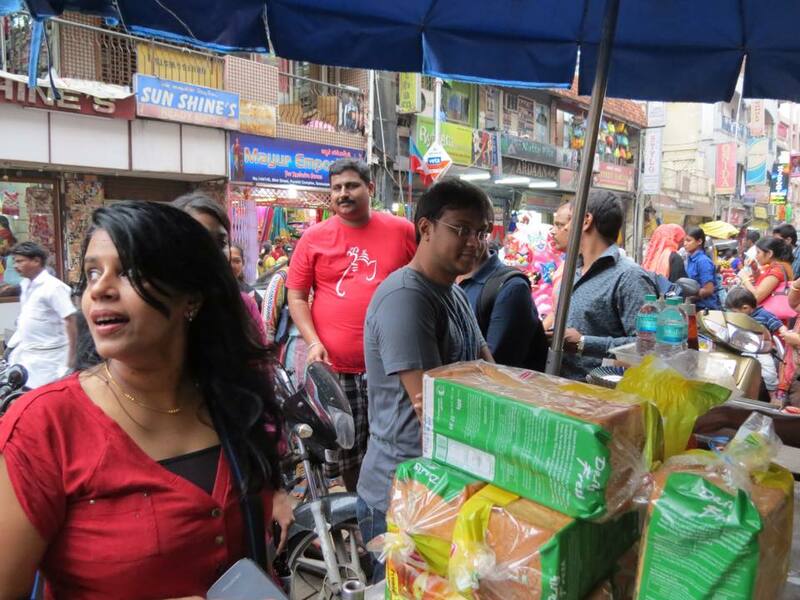 I also believe that the food walk was never ever possible without each one of you and your contribution. 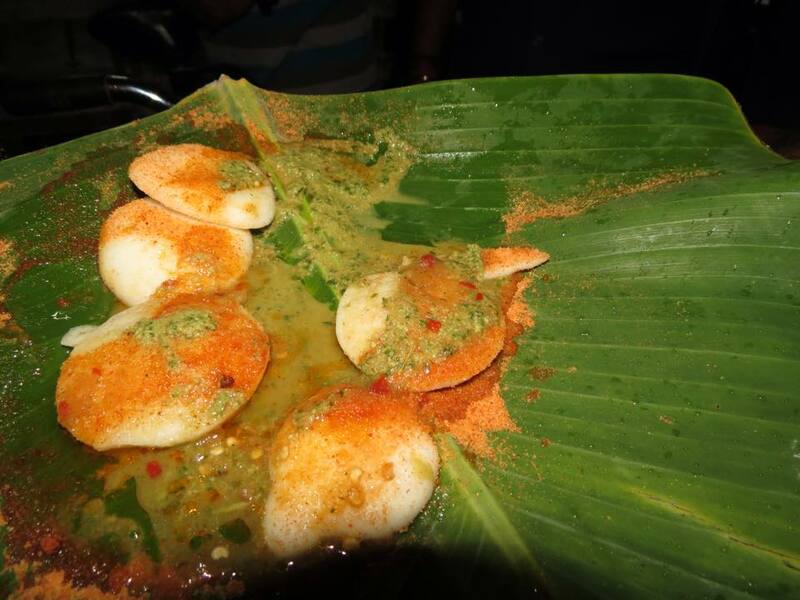 This entry was posted in The Food Walkers, Uncategorized. Bookmark the permalink.